Imagine an ocean of Light above you. Imagine the Light descending and filling up your body. Then, experience the Love and Peace of the Light for a minute. Then, imagine the Light spreading around gradually to your home, locality, country and the whole world. Channel Light & Heal the World. Light is God. God is Energy. Light is Energy. Light is many things and has many things. Light is everywhere. The Light referred here is of a higher realm, a higher frequency. Light is omnipresent. If the Light is everywhere, why should we channel it? We have to channel the Light to the human plane because It is at a different frequency. Can the Light not come down by itself? No. It will come down only if we seek it. God is available all the time but we have to seek Him. How to channel Light? How long should we channel Light? Imagine an ocean of Light above. Imagine that the Light enters you and fills up your entire system. Experience the Light for a moment. Then imagine it spreading out and gradually filling up your room, house, locality, country and the world. Channel Light daily for seven minutes anytime, anywhere. This is a kind of higher Meditation. You can also practice this technique for an hour or more. In the future, it will be necessary to meditate for several hours every day. What are the benefits of channelling Light? Light brings Peace and Love. Light brings Change in hearts, nature and environment. Light transforms. There will be no conflicts. No wars. Light heals. Light heals the wounds inflicted by violence and hatred on individuals and countries. 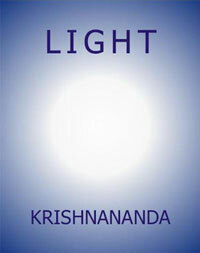 Light purifies our body, mind and intellect. It burns the Karmas of the individual and the countries. When Karmas are cleared, the destinies forced by Karmas change. If many channel the Light, the impact on the world is great. If many channel the Light at the same time, the impact will be faster. This is a video clip taken from the training sessions conducted by Guruji Krishnananda, where he speaks about the most important practice in the present times.